Be picked up from your accommodation within Ayers Rock Resort and travel to Uluru. Upon arriving at Uluru it’s time to get up close and personal with this big red rock. Be led by your guide on a short walk into the Mutitjulu waterhole. 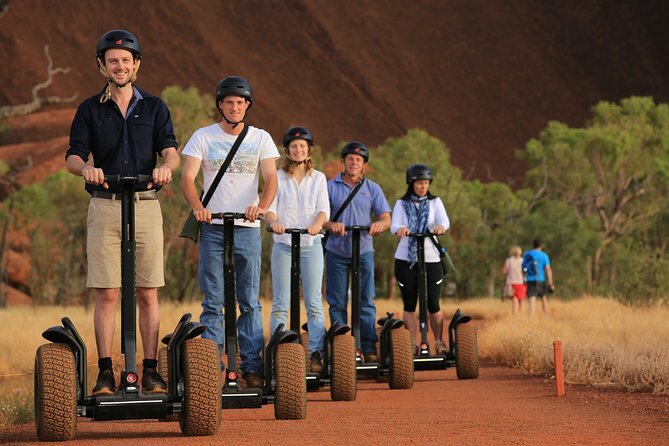 Now it’s time to learn how to Segway, before setting off on guided Segway ride around the full base of Uluru. Be mesmerised by the sights, sounds and cultural stories of this ancient rock. After completing the full base of Uluru it’s now time to travel back to your hotel within Ayers Rock Resort. Your four-hour tour begins with a complimentary pickup and transfer from your hotel or the campground at Ayers Rock Resort. Upon arrival at the segway base area, the tour guide will provide you with segway training. You'll take part in a short safety briefing and have a practice ride of your segway. Afterward, you'll be ready for your guided tour of magical Uluru (the native name of Ayers Rock). Departing from Kuniya carpark located at the base of Uluru, you'll be led by your fully qualified and knowledgeable guide into the iconic Mutitjulu Waterhole to explore the sights and sounds of the waterhole. Then quietly and effortlessly you'll cruise around the entire 10km base of Uluru.